The Massachusetts/New Hampshire (MA/NH) Chapter of the Alzheimer's Association has long sought ways to systematically increase the number of families who utilize its services and support. According to the Alzheimer’s Association’s 2015 Alzheimer’s Disease Facts and Figures, there are 142,000 individuals living with Alzheimer’s disease in Massachusetts and New Hampshire, and the Alzheimer’s Association estimates that less than 30% of those individuals and their caregivers take advantage of its programs (Alzheimer’s Association, 2015). The MA/NH Chapter recognized that one major barrier to accessing services is a model that relies on families taking the initiative to seek out assistance. In 2005, The MA/NH Chapter of the Alzheimer’s Association initiated the Health Liaison Program. Rather than relying on affected persons to reach out to the Chapter, the Health Liaison Program sought to improve chapter service utilization by encouraging health care providers to make direct referrals for families affected by Alzheimer’s disease and related dementias (ADRD). 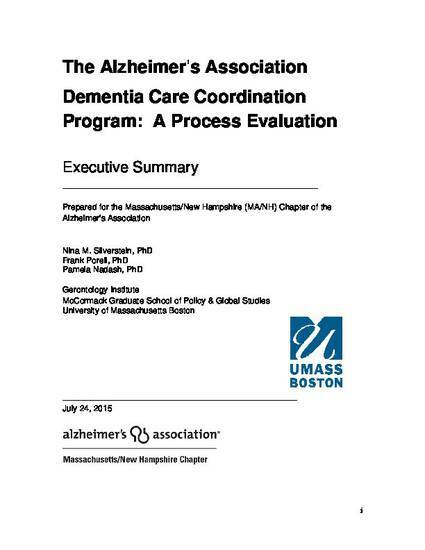 After many years of operating the Health Liaison Program with existing staff, the Alzheimer’s Association MA/NH Chapter decided to pursue funding to expand the Health Liaison Program into the more formal Dementia Care Coordination (DCC) program. This study reports on the Dementia Care Coordination (DCC) Program. In 2013, with support from a non-profit health insurer, Tufts Health Plan (THP) and a private funder, the Eisenberg Family Trust, the development and implementation of the DCC Program became possible. Under the DCC Program, dedicated care consultants connect directly with persons with ADRDs and their families who are referred to the Chapter by health care providers. Once connected, the care consultant is able to provide disease-specific education, symptom management strategies, emotional support, and referrals to community resources and encourage the caregiver to utilize other Alzheimer’s Association services including support groups, education programs, and advocacy opportunities. Consultants collaborate with other staff members and volunteers to provide ongoing information and support to families. Moreover, consultants provide written feedback to health care providers and nurse case managers on client needs and recommendations to meet those needs. Connecting families affected by ADRD with the services and support of the Alzheimer’s Association has important benefits for both the caregiver and affected person. Integrating primary care with caregiver support will likely improve the health status and quality of life for the person with ARDA and family caregivers. Mittleman et al. (2006) has demonstrated that such support and education delays institutionalization and improves physical and emotional health outcomes for the caregiver. Unfortunately, many caregivers delay seeking any kind of assistance. Richardson (2012) reporting on a 2012 study by the Alzheimer Society of Canada, stated that 44% of caregivers for people with ADRD waited a year or more, after the first signs of dementia, to seek any kind of support. The overall finding of this study is that the DCC program is highly successful and has engendered high levels of satisfaction by participants and multiple stakeholders. The DCC program represents an important element in a comprehensive integrated approach to patient care. Our analysis has also led us to make recommendations on how this important program can be improved, with the hope that it can be expanded and replicated. Prepared for the Massachusetts/New Hampshire (MA/NH) Chapter of the Alzheimer's Association.